The Marquette Food Co-op proudly participates in the Double Up Food Bucks program, which offers free produce for SNAP beneficiaries, equal to the amount of produce they’ve purchased using their Bridge card. When a shopper uses their Bridge card to purchase fresh produce at the Co-op, they are given a voucher of equal value — up to $20 per day — redeemable on ANY produce offered in the store during a future purchase. This national, grant-funded food access program administered by the Fair Foods Network — a food justice and sustainability nonprofit — effectively doubles the produce buying budget for those using Bridge cards. It matches dollar-for-dollar the amount spent on fresh produce in grocery stores and at farmer’s markets. For example, if someone spends $10 on fresh produce, they’ll receive a $10 voucher to spend in the same store on produce during a subsequent shopping trip. 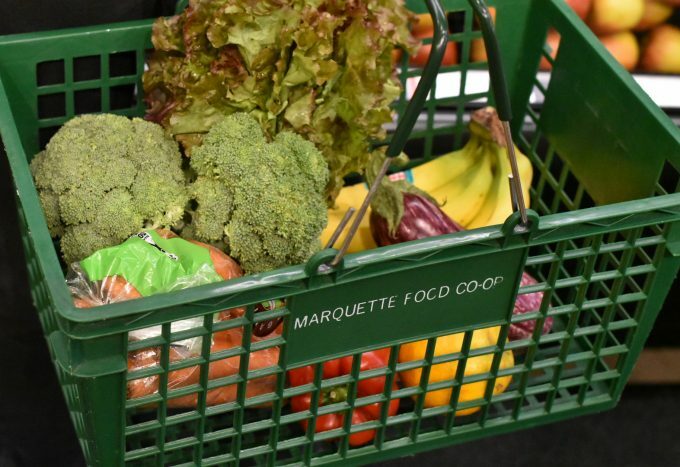 At the Marquette Food Co-op, shoppers who have made a produce purchase using their EBT card can bring their receipt to the Customer Service Desk at the front of the store to have a coupon printed. The coupon is redeemable for fresh fruits and vegetables only, and holds no cash value. Since its launch in five farmers markers in Detroit, Double Up Food Bucks has grown into a statewide success story in more than 200 sites across the state including farmers markets, grocery stores, mobile markets, and a network of farm stands. To date, SNAP shoppers have spent nearly $10 million in combined Double Up and SNAP benefits on healthy food. The program runs year-round. There is no additional registration needed, all Bridge card recipients are automatically eligible. For more information about the Double Up Food Bucks program, or the Fair Food Network, please visit doubleupfoodbucks.org or fairfoodnetwork.org.